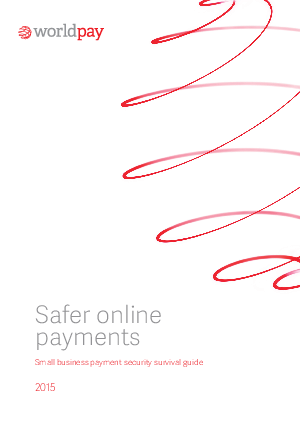 > Worldpay > Safer Online Payments: Small business Payment Survival Guide. In 2014, the UK saw online sales exceed £10bn per month. For small businesses, getting online is a great way to increase revenue. However, there’s no escaping the fact that small e-retailers are most at risk of suffering a data breach and that breaches are increasing. It is your responsibility to keep the card payment data of your customers safe and a failure to secure your systems could be a costly mistake which leads to penalty fines, lost custom and bad publicity. Worldpay is the leading payments provider in the UK and Europe. Whilst Worldpay has fewer businesses suffering data breaches,compared to our market size, we have a unique oversight on most UK card data breaches. We have compiled our insight and advice into this guide so all businesses, new or old, can ensure they are prepared. The prevalence of online payment fraud in the UK and how much it could cost your business. Your responsibilities as a merchant concerning PCI DSS compliance. The most common causes of data breaches and how to protect yourself against them. What you should do in the event of a data breach. Download now to find out how to make safe online payments.